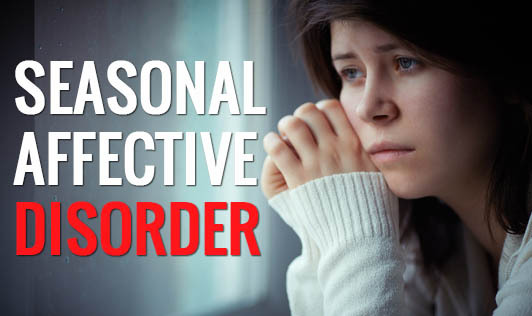 Seasonal Affective Disorder (SAD) is a type of depression that occurs at the same time every year. It is also sometimes called as winter depression, winter blues, or hibernation reaction. Symptoms of SAD may start in the fall and continue into winter months. It drains one's energy and makes one feel moody. Individuals who live in places with longer winter nights are at greater risk of SAD. Researchers have found that bright light changes the chemicals in the brain, however, the details of the same are still under investigation. Factors like low vitamin D levels in the blood are found to be linked with a higher incidence of seasonal affective disorder and some other depressive disorders. One's biological clock, serotonin levels and melatonin levels also play a role in this disorder. The factors that may increase one's risk of seasonal affective disorder are living far from the equator, and having a family history of SAD as well as having clinical depression or bipolar disorder. It is diagnosed more often in women than in men, but men may have more severe symptoms. It's quite normal to have some days when you feel down. But in case you feel low for days at a time and you can't seem to get motivated to do activities you normally enjoy, you notice changes in appetite and sleep patterns, or turn to alcohol for relaxation and comfort, please see your doctor immediately.